I actually had a lot of trouble writing this post. Most of my first few drafts comprised of me bitching about how there are no 24 hour delis, that everything closes at 10 pm, or that almost all the Chinese places are grossly overpriced, but if there's one bright spot I've found here, it's cheesesteak. 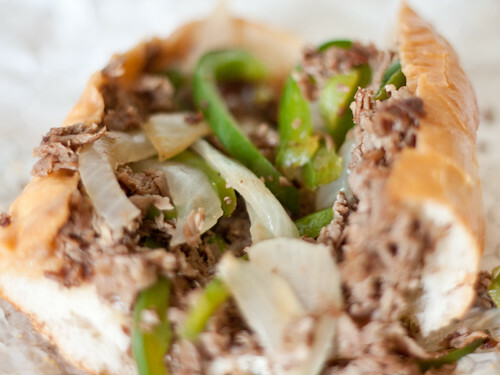 Philadelphia is supposedly the promised land of cheesesteaks. This is probably true... I wouldn't know. I haven't really made any effort to go very far to find them (give me a break, I'm lazy), but even my first random foray into steak and cheese exploration was on-par or better than any that I've eaten in the span of 4 years in NYC (don't crucify me for saying that, it's not meant to be an absolute statement). 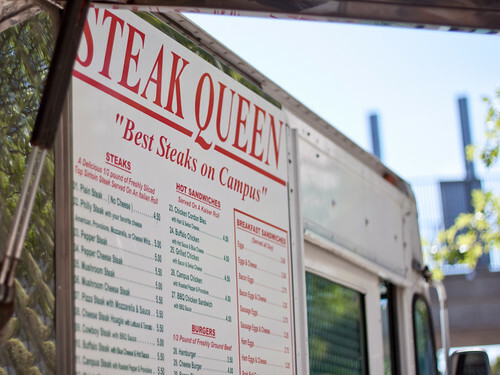 Case in point... Steak Queen, a truck that says they have "the best steaks on campus." 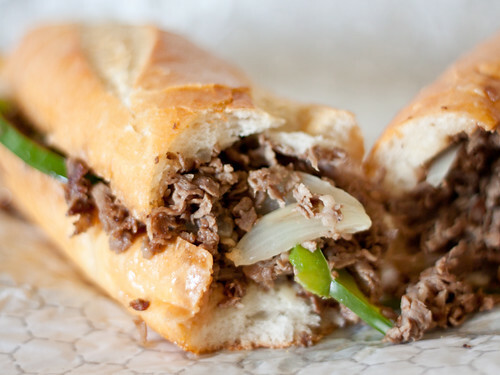 I don't ever like getting plain sandwiches, and I like to pretend I eat healthy, so I went with the pepper cheesesteak for $5.50. Measuring in at a hefty 11" (yes I used a tape measure), it's a decently sized sandwich, and it's cheaper than M2M, although I will miss conversing with the Filipino sandwich guys. Anyway, wait time is decent, size is good, price is low. I don't hold particularly high expectations for most stuff out of a truck, so it's looking pretty good at this point. Minor gripe, cut the sandwich all the way through please. Maybe it's okay for when you're just eating it, but it makes for a messy picture. Sorry. And the fillings. They claim to use 1/2 a pound of fresh cut sirloin, neither of which claim I can validate, and fill the rest with onions, green peppers, and I believe provolone cheese? All of this is really irrelevant, since all that really matters is how it tastes. The bread was soft, warm, and glazed over with oil... check. 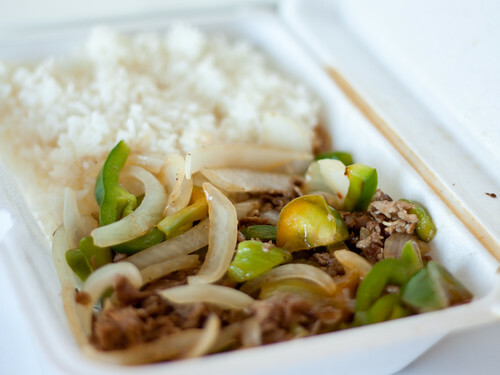 The filling was surprisingly juicy, complete with crisp peppers, sweet onions, and heavy on beef flavor... triple check. Basically? A damn good sandwich that's pretty cheap. Not a sandwich that I would want to marry or anything, but the type I'd bring home to my parents. The quintessential 'nice' sandwich. They serve other crap too, like burgers, platters, and wraps. Pepper steak over rice platters are $4.50, and I was expecting thinly sliced beef stir-fried with green peppers like from the Chinese places, but instead I was greeted with the above. It's basically cheesesteak filling over rice. Except instead of cheese, they use soy/hoisin sauce to finish it. Just as greasy, just as flavorful, it's as good as you'd expect. As an Asian person, I thoroughly approve of this marriage of rice and chopped steak. It feels so... right. Anyway, what's the point of all this? There is no point, I just felt like talking about the food trucks on campus, and this seemed like an appropriate place to start. bro, was there cheese on that sandwich? Whaaaat! This is a new cart on campus that I haven't heard of! That platter looks AWESOME! Man... trip back to Philly is needed. Rodzilla - yeah there's cheese. Provolone on the bottom so it kinda blends into the look of the bread. I like the direction of moving towards trucks on campus. Isn't there supposed to be a lot by Penn? or at least more trucks than there are around NYC schools. Gotta agree with you about cheesesteaks though. they're all pretty good to me. Unless someone is serving up some aged steak chopped up... it's all gonna be the same to me. Danny - Shhh, don't let anyone here you saying all steaks are the same. People in Philly would crucify you. It's true about Penn though, all I have are food trucks, maybe like 15 of 'em? Not as good as the specialty guys in midtown, but definitely good when you consider they're 1/2 the price.